How the RNS® System Works | NeuroPace, Inc. Similar to a pacemaker that monitors and responds to heart rhythms, the RNS System is the first and only medical device that can monitor and respond to brain activity. With more than twice the battery life (8.4 years) and twice the amount of available memory in the same size device, the next generation RNS® System lets patients live their lives with fewer interruptions and allows physicians to review a wider set of brain activity data, potentially enabling faster therapy optimization. With more than twice the battery life (8.4 years) at medium stimulation settings, and twice the amount of available memory in the same size device, the next generation RNS® System lets patients live their lives with fewer interruptions. The RNS® System is an award-winning technology developed and manufactured in Silicon Valley that has been recognized for its innovation. The RNS® System consists of a small, implantable neurostimulator connected to leads (tiny wires) that are placed in up to two seizure onset areas. It comes with a simple remote monitor that you use at home to wirelessly collect information from the neurostimulator and then transfer it to the Patient Data Management System (PDMS). Your doctor can log into the PDMS at any time to review accurate, ongoing information about your seizure activity and treatment progress. This helps your doctor learn more about your seizures and improve your care. The RNS® System involves a surgical procedure that is performed by a trained neurosurgeon. Prior to the procedure, your medical team conducts diagnostic testing to identify the location in your brain where your seizures start. During the procedure, your surgeon positions the leads at the seizure source and places the neurostimulator in your skull. Once implanted, the device is hidden under your scalp—unnoticeable to you and others. Most patients go home the next day. The RNS System is a reversible treatment that does not involve removing any brain tissue. Who is a candidate for the RNS® System? The RNS System is for individuals aged 18 and older who have tried at least 2 antiseizure medications but still suffer from frequent and disabling partial onset seizures that come from one or two areas of the brain. Talk with your doctor to find out if the RNS System is right for you. When should I consider the RNS® System? Studies have shown that if you have tried two antiseizure medications without achieving seizure control, there is a less than 5% chance that your seizures will be controlled on another medication. If you have failed two medications and still suffer from seizures, it may be time to ask your doctor about other treatment options, including the RNS System. Is the RNS® System covered by insurance? The RNS® System is broadly covered by private and government insurance. Can I expect to be seizure free? Although you should not expect seizure freedom from the RNS® System, a subset of patients report experiencing seizure-free periods. Source: Gwinn, et al. American Epilepsy Society, 2017. Combined trial outcomes include data from Feasibility, Pivotal (randomized, double-blind, controlled), and Long-Term Treatment (open label, prospective) Trials. *Based on last observation carried forward analysis. Will I be able to stop taking my antiseizure medications? The RNS® System is considered a complementary treatment to your medications. Any change in your medications would be determined by your doctor. What are the side effects of the RNS® System? The primary side effects associated with the RNS System are those that are related to any surgical procedure, such as risk of infection or bleeding. However, the RNS System does not cause the chronic side effects associated with many antiseizure medications such as dizziness, drowsiness, depression, or confusion. It also does not have the ongoing stimulation-related side effects associated with vagus nerve stimulation, such as hoarseness, shortness of breath, sore throat, coughing. Consult with your doctor about the full risks and benefits of the RNS System. Your doctor programs the device so that you do not feel or notice the stimulation. On average, the total amount of stimulation delivered by the RNS® System adds up to less than six minutes per day. Does the stimulation effect wear off? 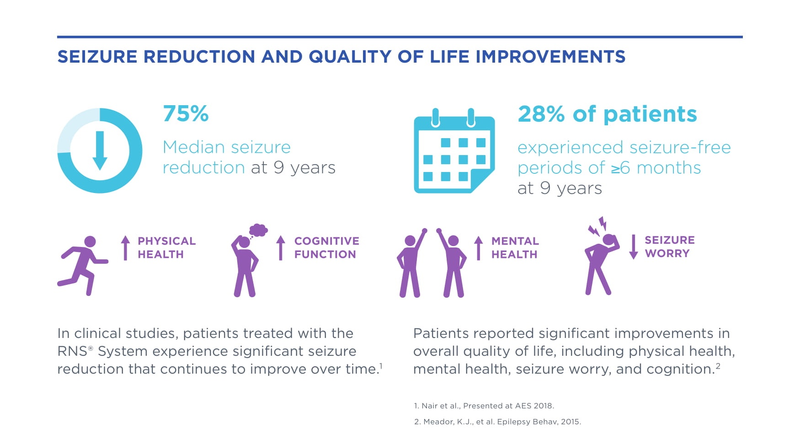 Although it can take as long as a year to see the full effect of treatment with the RNS® System, experience over many years shows that seizure reductions appear to continue over the long term. Does the procedure involve brain surgery? When doctors talk about epilepsy surgery, or brain surgery, they are usually referring to a surgical operation that involves removing the part of your brain that is causing your seizures. Similar to traditional epilepsy surgery, the RNS® System targets the part of your brain that is causing the seizures. However, unlike traditional epilepsy surgery, the RNS® System is a reversible therapy that does not involve removing any brain tissue. Where is the RNS® System available? The RNS® System is currently available at most Comprehensive Epilepsy Centers (CECs) throughout the United States. CECs are specialized epilepsy centers that have a team of experts who can provide a complete evaluation for epilepsy patients, along with extensive medical, interventional, and surgical treatment options. Find a Comprehensive Epilepsy Center near you.